I bought a new bike recently. I shouldn't have, of course. The kids need shoes and the end of the month seems to come about two weeks late these days. But I'd just turned 40. Some sort of milestone, for sure. I found myself increasingly drawn to On-one.co.uk. It started with the odd lunchtime look, but then I'd find myself with a discreet little window open while I was working. You know--just for reassurance. It found its way onto my Favourites. I'd had the same problem a couple of years ago and thought I'd shaken it. Apparently not. So I bought an Il Pompino. A sort of off-the-shelf custom freakbike all-in-one (you'll have seen Jezz's article). Mountain bike heritage, road-ish frame, V brakes, track ends, 135mm drop-outs... overall, a bit like a cyclocrosser, but without the geared flexibility. It came in singlespeed form, the 16t freewheel matched with a chunky 42t chainring to give a 70" gear. For a while I was happy enough. It was the honeymoon period you get with any new bike. But all too soon, odd things started to happen. I'd find myself chasing the pawls on that freewheel, pedalling furiously downhill, trying to spin as fast as the rear wheel. The physics made no sense, it wasn't making me go any faster. I was toying with the idea of sticking a track cog on there to replace that freewheel. I wanted to see if I could still be the rider I'd been when I last rode fixed in my early twenties. After a few weeks, I succumbed. It was a rainy Saturday afternoon. My youngest was having a nap, my eldest doing her reading with mum. I screwed on a 16t track cog and a little lockring, and popped out to check everything was OK. Fifteen minutes tops, barring incident. I set off down the dead-end lane towards the river, away from traffic. Barely round the corner from the house and I was already hooting to myself. It was like coming home. I turned and rode back up from the river in search of some bigger hills. I'm on the edge of the Cheshire Plains here, so hills are a relative concept, but when I get it in my head to 'get fit' I have this little loop. Three quarters of a mile up hill, about the same down again and a bit of flat back to the start. It's only about 200 feet of climbing, but it doesn't take long before you've done 1000 feet and then you feel it's starting to count. How would the fixer cope uphill? Not bad, really not bad. Of course I was standing on the pedals, breathing hard, legs burning and all that. But do-able, very do-able. I span down the other side, whirligig legs spinning, that was always the tricky half of the equation, but I managed without too much braking or bouncing around in the saddle. Reassured by a couple of those roady loops, it seemed only right to pop into the forest and test the bike's offroad credentials. I buzzed down the track towards the derelict country hospital, feeling like a guilty schoolboy sneaking past the developer's security guard, and swung off the track into the trees. I'd only ridden this track a handful of times, so it was far from familiar. And do you know what, it all went rather well. Absurdly over-geared, I was still able to wrench the bike around the tight singletrack curves. 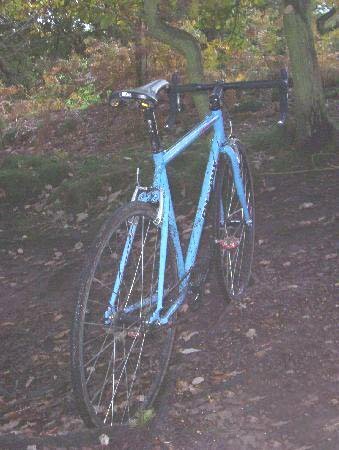 A few sections were too much--just how do you line yourself up for a log when the damn pedals wont stop spinning?--but the 28mm road tyres went way beyond the call of duty, cutting through the mud and not shirking the damp roots. Spat out of the end of the singletrack, I swung onto the firetrack and continued deeper into the forest, alive to the possibilities. I pushed on, more and more of my regular loops passing without death or serious injury. It was all far better than I'd hoped. The idea of using my jumped-up road bike as a serious offroad machine took on reality. I'd always vaguely thought of those people who'd chosen to ride fixed offroad as making things unecessarily hard for themselves. Attention seekers, who couldn't face up to the challenges of proper mountain biking. I was becoming one of them, it was a done deal. I kept coming back to that fun thing, and that was good enough for me. Sometimes it all gets a little bit familiar. I guess an inappropriate bike is one way to shake yourself out of that. Before I turned back from that first ride, I managed to raise a small cheer from a group of elderly walkers after cleaning an unlikely-looking climb. You know, like in the olden days, before bikes became evil and resented by certain folk in the outdoors community. Maybe I'm becoming a sentimental fool in my middle age, but those simple connections cheer me immensely. At the other end of the age spectrum, I managed to surprise both myself and the Jump Boys with what I assume was the first fixed wheel cyclocross descent of the local dual slalom course. That's what I'm claiming anyway. Anyway, 90 minutes later, I was back from the best ride in ages. Tired out from the nagging demands of that fixed drivetrain, but with that giddiness you only get from something silly and new. We've spent a fair bit of time together since that first ride, I've tweaked the tyres and stuck a more sensible cog on the other side of the hub, but riding that foolish bike is still way more fun than it ought to be. I could have said it all in three little words. Pure unadulterated fun. On-One have their own site. Jezz Harty reviewed his Pompino for us early in 2004. 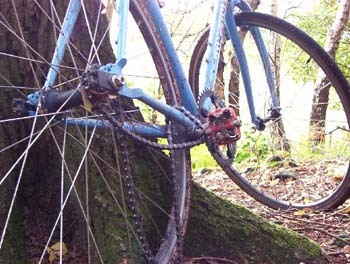 Steve has documented his bikes exhaustively, and wrote for us in spring 2005 about the Marin trail.